Vaporesso Target Mini black box mod uses a built-in 1400mah battery and even if it's small it comes with a convenient display and buttons that allow to personalize your vaping experience. Vaporesso Target Mini black box mod uses a built-in 1400mah battery and even if it's small it comes with a convenient display and buttons that allow to personalize your vaping experience. 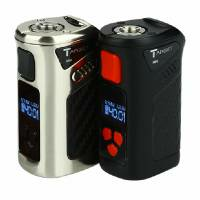 The Target Mini has a variable wattage up to 40W, a branded USB cable and everything you need to get the most out of your experience. Add Your favourite atomizer and e-liquid with or without nicotine. Battery charging: Recharge the battery using the supplied battery charger. Once connected, the battery level indicator will show progress.